We are happy, because the first round in englisch language starts today. The MOOC „Learning to Code: Programming with Pocket Code“ is explicitly aimed at schoolchildren. But be aware that we do not want to train the whole world as computer scientists. On the contrary, we simply want people to understand how the world of tomorrow works, so that they can help shape the world of tomorrow. So register and join it for free. There are many prejudices and fears about programming. 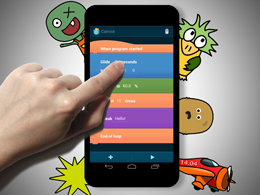 With the help of Pocket Code, particularly children will gain initial experience with programming. A simple and visual user interface enables a playful implementation of your own ideas. How can you join? Simply at any time, just register at iMOOX for free and go to the course page and join – have fun. Wir wurden eingeladen für ein Sonderheft rund um das Thema „CODING als Baustein der digitalen Bildung“ einen Beitrag einzureichen und haben hier unsere Arbeiten rund um den Einsatz von PocketCode an Schulen beschrieben. Den Kurs den wir beschreiben findet man übrigens hier.